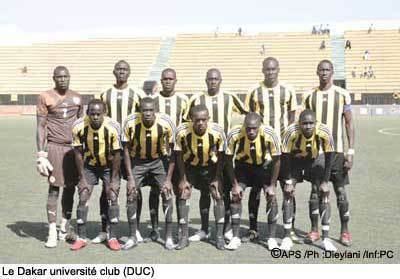 Dakar Université Club, mostly referred to as DUC, became number nine in the Ligue 1 2010-2011. DUC is a rather modest club, based in the Senegalese capital, with strong connections to the biggest university in the country, the Cheikh Anta Diop University. DUC lost their most important player, Pape Alioune Diouf, in January 2011. Diouf played 13 matches and scored two goals for FK Litex Lovech in the Bulgarian A PFG 2010-2011. Diouf was a trialist at Swedish side Kalmar FF a month ago. Please note that I currently have not found the scorer in the Round 22 match between Touré Kounda and DUC (0-1) on 20.07.2011, and in the Round 24 match between Guédiawaye FC and DUC (3-1) on 01.08.2011. However, I know that top scorer Abdoulaye Touré has scored one of these goals. For some reason, it has been rather easy to follow DUC this season, and I have found full line-ups from 24 of 30 matches. This makes it possible to rather precisely define the regular first eleven of DUC. The brilliant goalkeeper of DUC is Ousseynou Ndiaye. As far as I know, DUC usually plays with two central defenders, veteran Mansour Badji and Souleymane Sadio, and the young libero Diarga Fall. Youssoupha Koné is also a regular defender, most likely a full-back or wing-back. Cheikhal Ababacar Cissé and Jean Remy Bocande are both attacking midfielders / wingers. Fadel Fall has been one of the revelations of the season and I believe he is a midfielder. The last place in the team is usually taken by midfielder Pape Amadou Cissé or attacker / playmaker Cheikh Ndiaye. Ndiaye is a very interesting player, formerly of AS Douanes and the Senegal B and U-20 national football team. I believe it is fair to say that goalkeeper Ousseynou Ndiaye, and attackers Dembo Coly and Abdoulaye Touré, have been the most important players for DUC this season. The picture of DUC is taken from dakarfoot.com.